FORT LAUDERDALE, Fla. (Feb. 22, 2012) -- The Army is the nation's "force of decisive action," the Army is "meeting the needs of the nation" and "people are our Army." All three messages figure prominently in a new Army display shown for the first time at this year's Association of the U.S. Army symposium here. The new display features two curved walls that feature imagery to reinforce Army leadership's three "top line" messages and additionally features a "gallery of heroes" section to pay respect to the more than 400 Soldiers who have earned the Army's awards of valor during Operation Enduring Freedom, Operation Iraqi Freedom and Operation New Dawn. The Army is the nation's "force of decisive action," the Army is "meeting the needs of the nation" and "people are our Army." 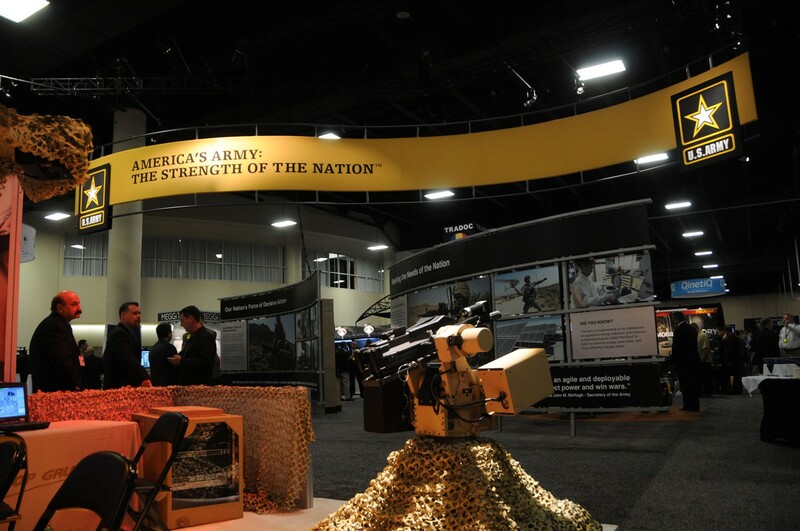 All three messages figure prominently in a new Army display shown for the first time at this year's Association of the U.S. Army symposium in Fort Lauderdale, Fla. While the conference display is new, the three messages are not. They were revealed by Army senior leaders in October at the AUSA conference in Washington, D.C.
People are "the essence of who America's Army is," said Lt. Col. Thomas Smedley, an Army spokesman who manned the service's booth on the display floor at the conference. "When you look back on our 237 years of history, from the Minutemen that defended at Lexington and Valley Forge, to the Doughboys, those that fought in World War II, those drafted into Vietnam, and now our all-volunteer force, it's men and women from the community," Smedley said. "Mothers and fathers send their sons and daughters into the Army, black and white, male and female. It doesn't matter your background or ethnicity. It's the citizens of America that make up our Army." The Army doesn't just engage in combat, it is a patron of new technology that eventually supports the entire nation, and it provides non-combat support in response to disasters that can affect all Americans. "It gets to the full-spectrum the Army provides, not just the operating Army out in the field, but the institutional or generating Army," Smedley said. "That includes the science and technology that the Army funds and supports to support its own Soldiers." The Army is working to develop new sources of power, such as solar, to provide for its missions. That technology will eventually filter out into industry. And the Army funds research and development of medical technology that also makes its way into the civilian world, to help the American citizens that pay for the Army. The Army is working with the NFL on concussion prevention, for instance, Smedley said. And Army research into tourniquets and the stopping of bleeding have made their way into the backs of ambulances to help EMTs help Americans. "That kind of research isn't just for the Army or DOD. It belongs to the American people," Smedley said. "We are giving that innovation back to America, back to industry, back to citizens to use on a daily basis." The Army also meets the needs of the nation at home with its response to disasters such as wild fires and floods, for instance. America's Army is there "to be that force in the community to help them out. We meet their needs in crisis as well." "When you commit Soldiers, America's sons and daughters to a mission, not just combat, that's decisive," Smedley said. "You now have the American flag and the American Soldier involved. That's in ground combat against a tenacious enemy, that's in places like Japan and Pakistan, whether it's the earthquake or the floods." Wherever America's Soldiers go, Smedley said, the Army brings "the right expertise, the right leadership, the right capabilities, the right tooth and footprint to the mission." Committing America's Soldiers to a mission is a decisive commitment, because it's a guarantee the mission will get done and will get done right.